Sri Lanka is home to four main religions, Buddhism, Hinduism, Islam and Christianity. This means there are a lot of public holidays each year – 25 in fact! Some of these holidays are celebrations that can be enjoyed by one and all. Here is a list of Sri Lankan festivals to consider coming to the teardrop island for. Vesak is the Poya festival that falls on the full moon of the month of March. According to the Buddhist moon calendar, it’s the first full moon of the new year. Vesak Poya is a triple celebration of Buddha. It is on this day that Buddha was born, found enlightenment, then many years later passed away. The Vesak festival takes over the city and most of the island. Every home and place of business hang white paper lanterns that are lit up at night. Areas like Baudaloka Mawata and Biera Lake are specially decorated. People hand out food and drink to passers-by on the streets and worshippers spend hours at the temples. Another huge Poya celebration is the Esala Poya Perahera in Kandy. Esala Poya is the day that celebrates the arrival of the Buddha Tooth Relic to the famous Temple of the Tooth. Perahera means procession in Sinhalese. Peraheras take place every Poya holiday on small scale in Colombo and other places around the island, but none compare to the week-long celebrations in Kandy during Esala Poya. With a Perahera procession every day for a week, the experience is unbeatable. Dancers, musicians, dressed elephants, rituals and more, every day until the last night which is the biggest Perahera of all. Best way to make sure and get a seat at one of the Peraheras in Kandy next year is to book through an agency like Lakpura. Another grand Poya festivity is Poson Poya, which is the celebration of the arrival of Buddhism in Sri Lanka, It usually takes place during the full moon in June. There are celebrations all over the island like all Poya days but the main festivities for Poson Poya are at Mihintale. The Mihintale rock outcrop is believed to be the first place that the Buddhist monk Mahinda talked about Buddhism with King Devanampiyatissa. To get to Mihintale you can take a train to Anuradhapura and a car from there. Maha Shivarathri is the celebration of the Hindu god Shiva. Festivities take place in June in the Hindu Shiva temples around the island. Devotees take a purification bath at dawn and fast all day. Many of them take part in mediation rituals with the help of the Panchakshara mantra “Om Nama Shivaya“. Shiva statues are also bathed in milk and honey and covered in red vermillion to represent purification of the soul. Some temples, like Sri Kaileshwarar temple in Colombo, have dance and music performances as part of the celebrations. Deepavali is the Hindu festival of lights, it is the celebration of Lord Rama’s defeat of Ravana, symbolizing the defeat of light over darkness. Homes will be decorated with little clay lamps and buildings and streets are illuminated in celebration. In Western calendars, it takes place usually in October or November. Deepavali celebrations last for five days but the biggest and most important day is the last. Devotees will wear new clothes and give each other gifts, usually of sweets. The Sinhala and Tamil New Year marks the beginning of the Lunar year. It usually takes place sometime in April. Festivities are colorful and fun all around the island. Just like the Poya holidays, all formal or government businesses close and the island takes on a relaxed festive state. This is a festival celebrated by the entire population. Sri Lankans love friendly competitive games and the New Year is when you will find these kinds of games happening everywhere. Ramadan is the month long Muslim festival of cleansing and fasting. The festival begins at the first sighting of the new moon. A lot of restaurants will have special nighttime menus for Muslims to come together and break their fast. Eid, on the last day of Ramadan is big celebration of feasting and giving. 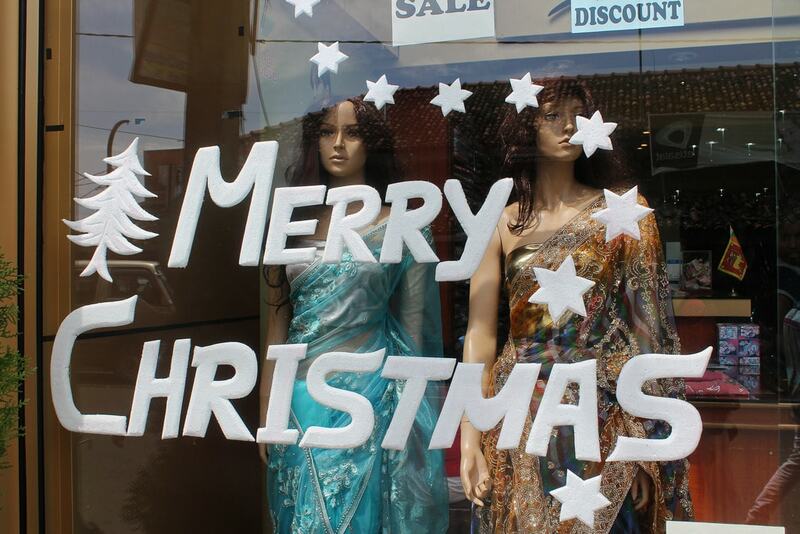 Even though only about 20% or less of the population in Sri Lanka is Christian, Christmas is still a big celebration on the island. Every mall, store, business and bakery is colorfully decorated with trees, lights and garlands. Religious places or businesses owned by Christians, will have nativity scenes. All big hotels serve Christmas dinner on the 24th and the Cinnamon Grand Hotel decorates the lobby to a great extent. Just a visit to the hotel is a big enough Christmas experience in Colombo. Don’t forget to try the Sri Lankan Christmas cake, the richest and most spiced cake in the world.